BVM offers complete parts and service for all of the retracts, struts, wheels and brakes that we manufacture. Because we fly what we sell, and continue to learn how to improve the products, these highly stressed components are updated in design and manufacture when appropriate. Should your BVM landing gear system get damaged, we have the parts, trained personnel and equipment to return them to new condition. Under a severe landing load, it is usually more than just one part that gets distorted and, the smooth function of the adjacent parts is critical to reliable operation. To check for proper function of our scale undercarriage systems, each new and repaired unit is mounted into fixtures to be sure that the retraction angles (up and down) and the wheel/axle tow-in are perfect. Scale models leave little room for errors here. When you send your units to BVM for repair, we will first asses the damage and prepare a written estimate of the costs of parts and labor and inform you by phone or email. For the complete process of getting the components returned to you, plan on 2-3 weeks. For the early, all CF plastic units and the F-16 main retracts, allow a bit longer. The few weeks before the major jet events are usually more busy than normal, so try to allow for this and send them in early. Of course, we can supply customers with parts they need for a BVM product. 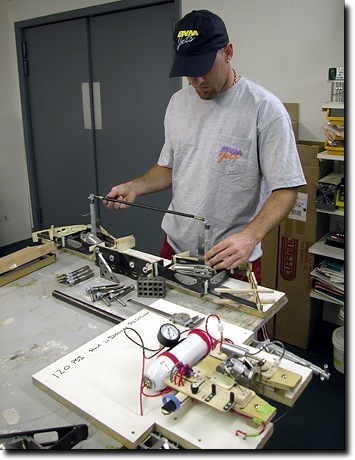 For many repairs however, normal model shop tools and techniques are insufficient to affect a proper repair. To get back in the air with properly functioning undercarriage, most customers have depended on BVM to fix it right the first time.